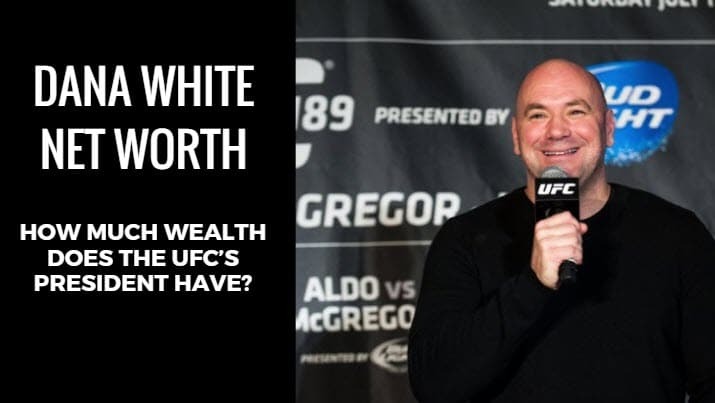 Dana White Net Worth: How Much Wealth Does the UFC’s President Have? It’s not easy to be a successful businessman. Anyone who manages major organizations and large rosters knows it can be tough. Tough to keep everyone in line and keep everything on schedule. The rougher the business, the rougher the job. It makes managing the world’s premier mixed martial arts promotion as one of the toughest tasks anyone can image. But Dana White has mastered this role and enjoyed the wealth that comes with the responsibility. Dana White net worth growth has coincided with the growth of the UFC. As its president and its primary mouthpiece, he’s found himself in plenty of tense situations and feuds. With prizefighters known for their showmanship and tenacity. The boss of an organization full of them has to follow suit. White has done that, and despite mixed feedback about his leadership style, he’s enjoyed plenty of success. With a salary of $20 million, White’s net worth in 2017 was listed at a staggering $500 million. How did he amass such a large amount of wealth? How has his leadership affected the UFC and the sport of MMA as a whole? White grew up in Manchester, Connecticut, and began boxing when he was only 17 years old. His interest in combat sport led him into the boxing ring but also into the ranks of MMA managerial duties. He also serves as a manager for Chuck Liddell and Tito Ortiz, both of whom would go on to become UFC champions and are still revered as legends to this day. It was then the now-revered-businessman found what every successful person needs – an opportunity. With the parent company of the UFC (Semaphore Entertainment Group) looking to sell the promotion, White sprang into action. He contacted childhood friend Lorenzo Fertitta who was already a successful casino executive in Las Vegas. Lorenzo worked with his older brother, Frank, and the two ultimately bought the promotion with White added to the equation as president. He owns 9 percent of Zuffa LLC, an entity the Fertitta brothers created to manage the UFC. Even when the promotion has sold to WME-IMG in 2016, White continued his role as president. With the UFC skyrocketing MMA into the mainstream, he has thrust into the spotlight as a result. While White has risen to the top quickly and showed off his skills at managing major matters in a relatively new field, he hasn’t done so without criticism. Whether he was fending off criticism about his own sport or responding to feedback about his leadership style, White has traded verbal barbs with many different individuals both in and out of the UFC. Boxing promoter Bob Arum and White have traded criticisms of one another’s business styles. White accused Arum of sucking the life out of boxing, while he fired back by saying the UFC doesn’t pay its fighters enough. While White proclaimed Arum was a poor promoter, Arum described White as a loose cannon. As Dana White net worth and earnings have increased over time, he has also had some strained relationships with members of the UFC roster. This includes former heavyweight and light heavyweight champion Randy Couture as well as former light heavyweight champion Tito Ortiz. Ortiz and White have feuded on multiple occasions, with Ortiz even accusing White of trying to erase his legacy. White also caught flack for using derogatory language when referring to MMA reporter Loretta Hunt. He’s even chastised for using anti-gay slurs when referring to some news sources. White’s success may have caused him to make some enemies along the way. But his contributions to the UFC have been evident. With his tenacious attitude toward promotion and growth, he’s helped oversee MMA’s acceptance into the mainstream. He also played a big role in creating a new primetime sport. Hundreds of fighters, coaches, and trainers owe at least some degree of appreciation to him. White’s massive net worth will likely continue to rise. The UFC continues to break records for pay-per-view and ticket sales. They put some of the money back into sources White deems a worthy cause. In 2011, he donated $100,000 to his high school to help renovate their athletic facilities. He also appeared in It’s Always Sunny in Philadelphia and The League. Being one of the leading forces behind a taboo sport evolving into a mainstream phenomenon is by no means easy. White fended off plenty of obstacles both financial and political in steering the UFC toward success. He now has years of success and plenty of commendations to his name. White has emerged as one of the sports-management world’s most high-profile success stories.